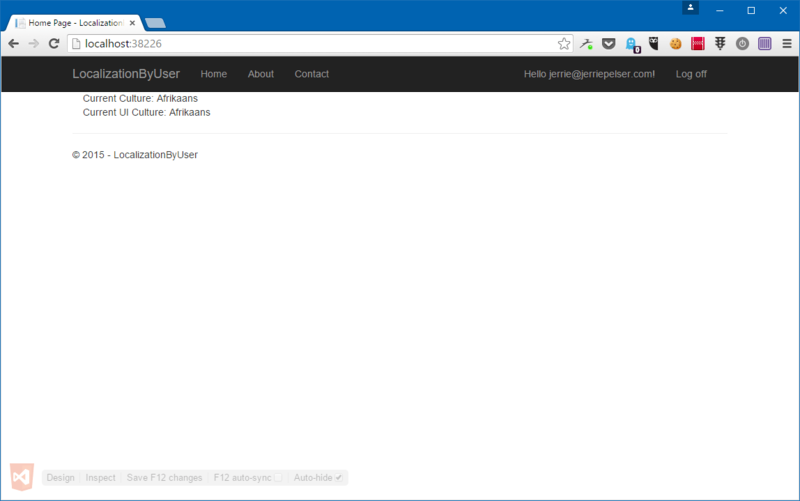 In a previous blog post I demonstrated how ASP.NET 5 determines which Culture settings to use when serving a request. That is fine for many cases, but in some instances you want to allow users to save their culture settings preferences in their user profile. This is Part 1 in a 2 part series when I will demonstrate how you can do this. In this blog post I will show you how we can allow a user to pick a specific culture and then save that against their user profile. In the next blog post I will demonstrate how we can allow the user to store the culture settings at an even more fine-grained level. This will add a new migration to add the necessary columns to the database for the new fields we added to the ApplicationUser class. This will ensure that all outstanding migrations are applied to the database. Text = "-- Not specified --"
We are going to have to extend the Localization middleware to set the culture settings for the request based on the user’s settings. We will however need to get the culture info from the User table in the database, but we do not want to make a query to the database everytime we do this. Phew. I hope you’re still keeping up. The next and final step is to create our own Request Culture Provider. 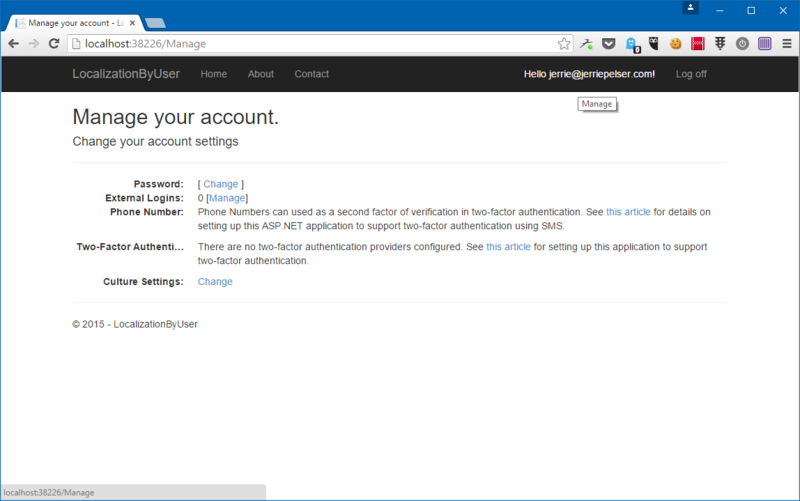 Remember when I spoke about how ASP.NET 5 determines the Culture for a request?. In that blog post I mentioned the list of Request Culture Providers which are defined in the RequestLocalizationOptions class. So I get the values for the culture and the UI culture from the claims. First I check whether the request is authenticated, and if not I return null. If neither value is set then I also return null so one of the other providers can provide the correct information. Also, if only one of the values is set, then I will default the other to that value. Finally I need to register the new provider, so I will need to update the call to app.UseRequestLocalization() in my Configure method. The thing is however that the Localization middleware is now dependent on the Authentication middleware having executed, because otherwise I will not be able to access the claims I required to determine the user’s preferred culture. Note that because I am moving the Localization middleware to execute later in the request pipeline, all middleware registered before that will not be able to take advantage of Localization. In my case this is not an issue, as it is only really the error pages which will now not be able to take advantage of Localization, and I am not too concerned about that. I want to you however to be aware of this, so make sure this does not affect any other aspect of your application in an adverse manner. Currently it displays “English (United Kingdom)” because that is what my browser is set to. 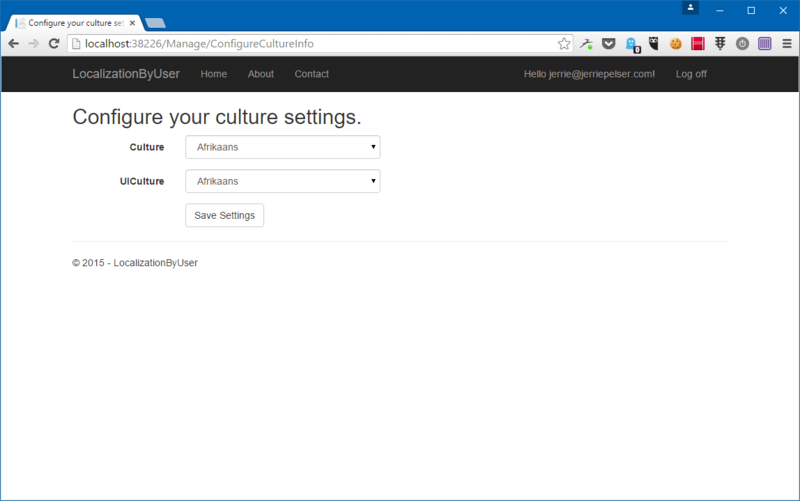 In this blog post I demonstrated how we can allow the user to specify their own culture settings. In the next post I will demonstrate how we can allow the user even more flexibility by allowing them to override their date and time formats. 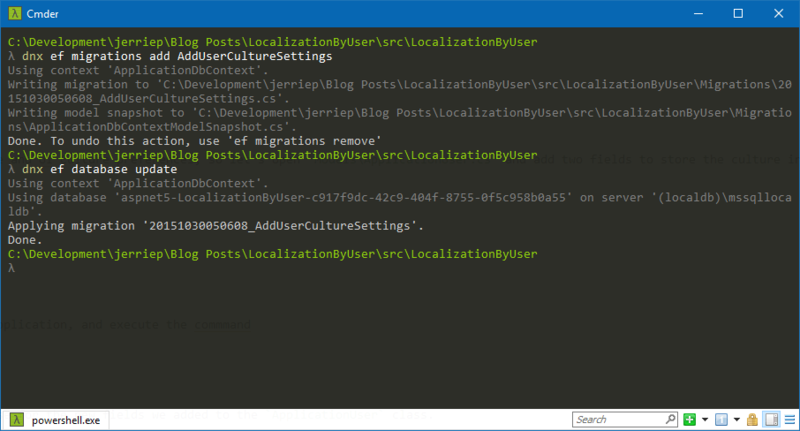 For non-signed in users, or users who have not specified specific culture settings, the same rules apply as I described in How ASP.NET Determines the Culture Settings for Localization. When a user is signed in and they have chosen to specify custom culture settings, those will take highest priority over all the other methods which determine the culture settings.